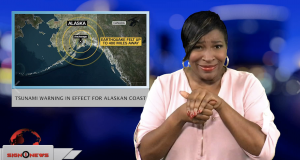 Parts of the Alaskan coast is under a tsunami warning after an earthquake, today. The tsunami warning is in effect for coastal areas of Cook Inlet and the southern Kenai Peninsula. According to NOAA, the earthquake happened this morning with a preliminary 7.0 magnitude. The epicenter was 7 miles from Anchorage. The quake rocked buildings in the city and sent people rushing for cover. The NOAA says the level of tsunami danger is being evaluated for other U.S. and Canadian Pacific coasts in North America.